HTE Automation leads the field in manufacturing robot technology, including the high impact Cobot (collaborative robot) which interacts in human workspaces. Whether you need a SCARA robot, multi- or single-axis positioners, or a traditional industrial robot to include safety interlocks and guarding, HTE will develop a solution to improve your plant productivity, flexibility, labor costs, efficiency, safety, and throughput. Regardless of your application, our comprehensive range of robots includes a solution to meet your needs. Robots are commonly used for repetitive or dangerous tasks including material handling and removal, assembly, pick-and-place, packing, welding, testing, and inspection. HTE’s TECHTEAM members are experienced in a wide array of industrial robotic applications. Available for any size or speed of task or industry, they are skilled to assist in choosing the best product, helping with integration and start up into your facility, and aiding with ongoing support or training. 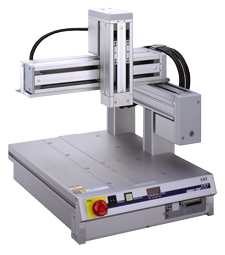 Our line of industrial robots represents the top robotic manufacturers including Universal Robot, Epson, Precise Automation, and IAI (Intelligent Actuator Inc.) Providing strength, endurance, and precision to your production processes, our selection includes vertical or horizontal types, 4, 5, or 6-axis configurations, ceiling mounted, single-axis, and SCARA robots. Universal Robot presents the UR3, UR5, and UR10, our most popular robots, which are referred to as Cobots (collaborative robots) due to their ability to safely work alongside people during production. Since they have the ability to work in any sized application, industrial robots are found in many industries. Automotive, healthcare, general manufacturing, food and beverage, and metal fabrication are just a few of the industries where you can find robots working in the plant. From complex assembly tasks to simple pick-and-place applications, HTE’s selection of robots can assist with any fastening, organizing, moving, or other factory automation job in your plant. HTE Technologies is your resource for any industrial robotic needs if you are located in Kansas, Missouri or Illinois.